The clock was turned back 76 years or so in North Northam- ptonshire on Remem- brance Sunday as a convoy of Jeeps and Dodges wound their way between air bases of the mighty US Army Air Force. They were joined by more modern vehicles such as Land Rovers, a Champ, Ferret, DAF and Dodge Ram to help mark the special day. t began at John and Judith Underwood’s house in East Carlton where we were treated to bacon butties to prepare us for a cold but sunny day. 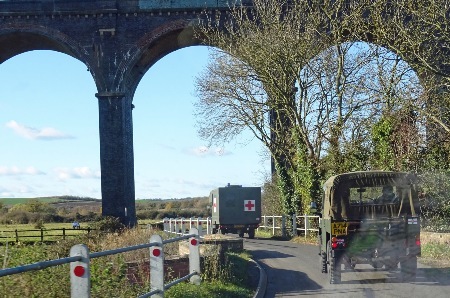 Led by John in his Ferret, our first stop was Weldon where the Royal British Legion had invited us to their service at the village war memorial. Then it was back to East Carlton via Eyebrook Reservoir, where the Dam Busters’ Lancaster crews practised low level runs in 1943. Judith and her helpers had prepared a tasty meal of soup and beef stew with pineapple upside-down cake or rice pudding to follow. John also opened his packed private museum for viewing. Then it was on to Grafton Underwood airfield for another service and wreath-laying. This is where the Flying Fortresses of the 384th Bombardment Group operated and we were delighted to see that the US Air Force had sent a representative with a wreath. 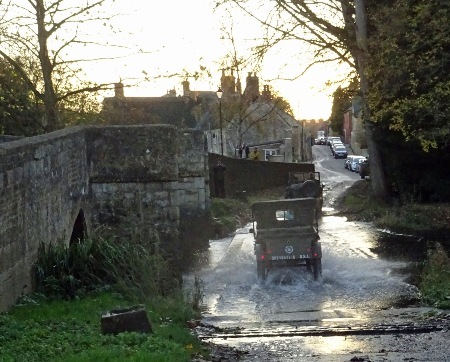 We couldn’t leave this area without making a splash in the ford at Geddington before heading back to our respective garages. Many thanks go to John and Judith Underwood for organising this enjoyable and thought-provoking day. The following pictures are from Stuart King . . . Harringworth Viaduct . . .